MORE THAN 5,000 people joined a protest today to speak out against controversial plans to build a flood defence wall along Clontarf’s 3km promenade. Local Gardaí believe about 5,000 people turned out for the event, while Clontarf Residents Association chairperson Deirdre Tobin told TheJournal.ie that more than 5,000 signatures were obtained for a petition. Politicians, including Independent TD Finian McGrath, Minister Richard Bruton and Labour TD Aodhán Ó Ríordáin, address the crowd. Author Roddy Doyle also made an emotional speech, telling the audience that Dublin City Council’s plans for an 8-foot-high wall along the seafront was a “national crisis” and not just a local one. Residents say they welcome the need for a flood defence system but reject the current plan, citing tourism and safety as two reasons. A meeting is due to take place next Friday between City Council officials and residents. Thanks to Daryl Feehely and Dan Walsh for the images. Email “Clontarf residents protest over flood wall plans”. 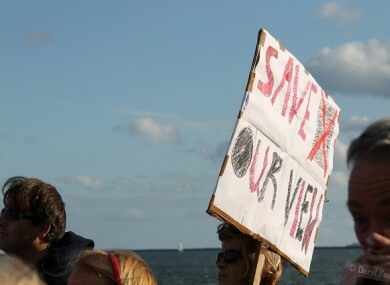 Feedback on “Clontarf residents protest over flood wall plans”.